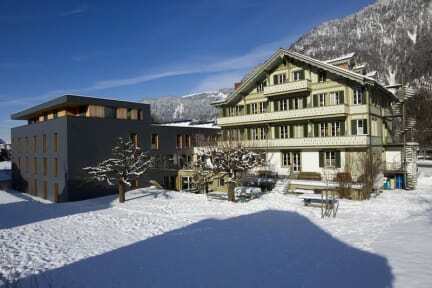 Backpackers Villa Sonnenhof (Hostel Interlaken) i Interlaken, Schweiz: Bestill nå! Oversatt av Hvis pusten naturlig skjønnhet er noe som kiler din fancy, er Backpacker Villa det perfekte stedet for deg. Borte er de dager da lavbudsjetts ment andre sats, på denne reise havn kan du nyte adrenalinkick av de sveitsiske alper (fallskjermhopping, paragliding, you name it) og utallige andre fantastiske fasiliteter uten en heftig prislapp. Anmeldere har kalt det "den beste hostel noensinne", sier at den luksuriøse atmosfæren etterlater deg følelsen som om du bor i et velstående hotellet. We've got FREE: WIFI everywhere, breakfast, linen (incl. dorms) and towel, lockers, use of local buses, entry to swimming pools, mini golf, parking and taxes! Stay at the only original Backpackers Villa! We provide your perfect base if you’re looking for the comfort and convenience of a centrally located hostel with a green garden in the rear and a large park at the front that offers just that little bit extra. Interlaken has developed over the years into a centre for travellers looking for the ultimate adrenaline kick surrounded by unsurpassed natural beauty. With accommodation ranging from dorms to double rooms, both with shared showers/toilets or ensuite facilities, we offer everything to make your stay really enjoyable. We feature top accommodation with friendly and clean rooms (with 2 to 7 beds ensuite or shared) and a large garden to chill out in. You can cook and chat in our self-catering kitchen and stay in touch via free Wi-Fi in the whole building or internet stations in the lounge. Rates include our all-you-can-eat continental breakfast, linen, made up beds with comfortable duvet, a towel, personal lockers, free entry to public swimming pools and mini-golf, free parking facilities and all taxes (VAT & local taxes). Your clothes can get a nice wash in the laundromats while you enjoy the meditation or music room or one of the free movies from reception to recover from your excitements of the day. Naturally, there’s no lockout or curfew. We’re 100% climate neutral (myclimate.org). Our all local and multilingual staff are happy to tell you their personal best ideas of what to do and how to best spend your days. Reception is open 7am till 11pm to help with information and free maps for hiking and loads of things to do. We’re your ticket office for adventure activities such as rafting, canyoning, paragliding, hang gliding, skydiving, bungee jumping and more. During winter season (from December to April) you can get lift passes and discount voucher for ski/snowboard rentals at reception.